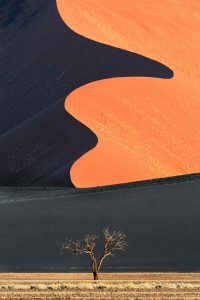 The enormous red dunes at Sossusvlei, Namib-Naukluft National Park, Namibia. Sossusvlei is a salt and clay pan surrounded by high orange dunes, located in the southern part of the Namib Desert of Africa. 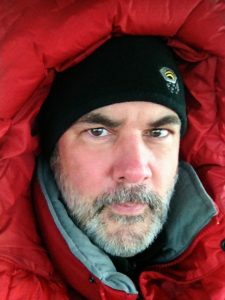 Over the past dozen years or so, I’ve had the pleasure and privilege of traveling to more than 50 countries while working and photographing for some of the world’s top magazines and news organizations, leading exotic landscape and wildlife photography tours, and just venturing out on personal photo adventures. 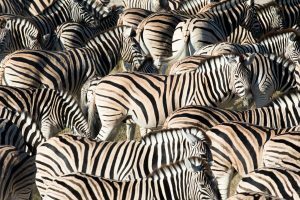 Many of these countries are on the African continent, where infinite mystery and adventure await the intrepid outdoor and wildlife photographer. From the interstellar emptiness of the Sahara, to the rolling savannas of the Serengeti and Maasai Mara, to the misty volcanoes of Rwanda – the home of mountain gorillas – to the Western cape of South Africa, I have explored and photographed much of this extraordinary continent. But if I had to choose only one country in which to spend my valuable personal shooting time, I would point myself in the direction of Namibia in southwest Africa. The enormous red dunes at Sossusvlei, Namib-Naukluft National Park, Namibia. Sossusvlei is a salt and clay pan surrounded by high orange dunes, located in the southern part of the Namibia Desert of Africa. Namibia is a place of contradictions and extremes – ocean and desert, water and no water. It receives less rainfall than any country in sub-Saharan Africa yet it shares a 1000-mile, wild and untamed coastline with the frigid waters of the South Atlantic Ocean. The climate is hot and dry in much of the country’s interior but wet and cool along the seaboard as humid ocean air collides with the desert heat. A spectacular array of life makes its home on the sprawling white pan of Etosha and other reserves while much of the barren Namibian landscape appears impoverished and sterile. Extremes. Photographers live for extremes, contrasts, ironic juxtapositions, and visual contradictions, which is what makes Namibia such a fascinating place. Here are some highlights of my favorite African country, Namibia. 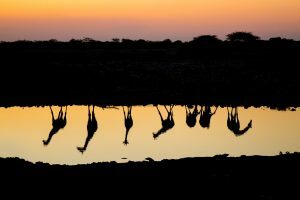 Etosha National Park in north-central Namibia is one of the premier wildlife parks in southern Africa. It’s the most important wildlife sanctuary in Namibia and one of the largest savanna conservation areas on the entire continent. Its landscape is characterized by patchy grasslands, scrubby forests, white clay flats (called pans), and numerous, life-giving water holes. These water holes are key to finding wildlife, especially during the winter which is the dry season. 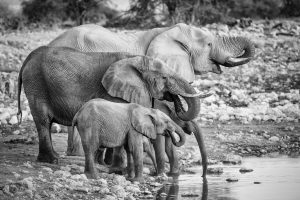 Elephants, lions, giraffes, rhinos, and most major African megafauna can be spotted and photographed in large numbers throughout Etosha and beyond the park’s borders. In order to photograph wildlife during the day’s best light, you should plan on staying inside one of the park’s base camps. The gates into and out of the park are closed and locked at sunrise and sunset so the water holes nearest to the Okaukuejo, Namutoni, and Halali camps are your best bets for wildlife photography in optimal light. Each camp also has a water hole with evening flood lights that can be photographed from inside the camp’s fencing. It’s relatively easy to drive and self-guide an Etosha photo safari but if you take a game drive with one of the National Park guides and vehicles, the side rails are too low for a beanbag support and there is not enough space for a tripod. A monopod is perfect for supporting a big lens in this situation. I regularly use a Really Right Stuff MC-34 monopod and MH-01 head for Etosha and other African photo safaris when space is limited in the vehicle. The Namib Desert is one of the oldest and largest deserts in the world, stretching almost 1200 miles (1600 kilometers) along the southern Atlantic coast through the countries of Namibia, Angola, and South Africa. The word Namib literally means “vast place” and that it most certainly is. 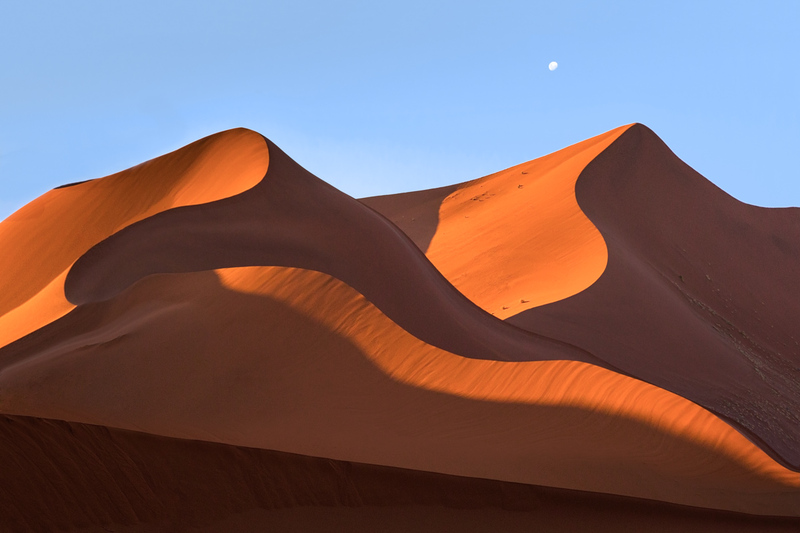 In Namibia, a large portion of the Namib desert is protected within the Namib-Naukluft National Park. The Park is home to the largest sand dunes in the world, some reaching as high as 1200 feet, each with different shapes, sizes, textures, and colors. The possibilities to create unique landscape images here are as limitless as the imagination. Within these towering dunes you will find hardened, windswept clay and salt pans called vleis. Two popular examples are Sossusvlei and Deadvlei, which are accessible from the national park gate at Sesriem. A 4WD vehicle with plenty of clearance is needed to advance beyond the paved road and continue through the sand to the very end. You will find Sossusvlei at the road’s terminus while Deadvlei requires a 20-minute hike from a small parking area. 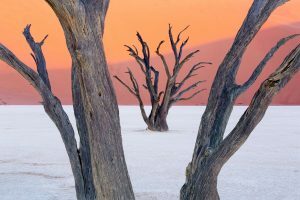 Deadvlei features dozens of dead, structurally intact camel thorn trees that are surrounded entirely by giant sand dunes. The early morning and late evening light is best for photography when the warm, low-angled sunlight intensifies the dunes’ bright orange and red hues. There are certainly opportunities for wide-angle landscapes at Deadvlei and in the Namib Desert, but since there rarely any clouds overhead or on the horizon the skies are rather boring. I like to mount a medium to long telephoto lens on my camera and isolate intimate scenes instead. Look for patterns, textures, shapes, and interplays of shadow and light. 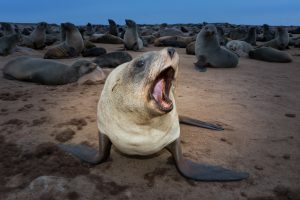 When you first walk out among the tens of thousands of cape fur seals at the Cape Cross Seal Preserve, you will immediately experience a multi-sensory overload for better and for worse; the sights, the sounds, and yes, the smells all converge on you at once as you realize there is nothing normal about this place. This remarkable wildlife reserve sits about 80 miles north of the coastal town of Swakopmund along Namibia’s remote Skeleton Coast. It’s home to the largest colony of cape fur seals in the world where as many as 200,000 of these specimens congregate on the beach at once to feed and fight for potential mates. There is an elevated boardwalk that literally brings you face-to-face with many of the colony’s malodorous members. Although your initial impulse might be to grab the longest telephoto lens in your bag, there are creative composition options at many different focal lengths, including some wide-angle opportunities. Near the town of Keetmanshoop is a unique forest of “quiver trees”, one of the most fascinating landscape photography destinations in Namibia. Quiver trees are not actually real trees, but rather a species of Aloe plant. 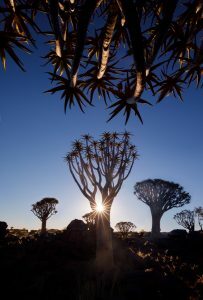 Rarely reaching more than 20 to 25-feet in height, they’re referred to as quiver trees by the locals, since bushmen once used the hollowed-out branches to make quivers for arrows. Visit the forest late in the evening for sunset, but don’t expect any clouds to help with color in the sky. Capturing a sunburst before sunset or the soft pastel light after the sun sets will make for some of the best photo opportunities. Night photography here is excellent and the distinctive shape of the trees make perfect silhouettes against the starry sky. 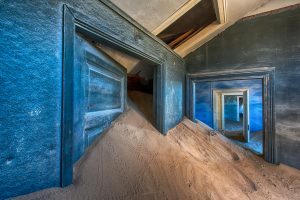 Once a thriving settlement built around a productive western Namibia diamond mine, Kolmanskop is now an authentic, honest-to-goodness African ghost town. When diamond production ceased in the mid 1950s, the town was abandoned while the houses and buildings were left to fend for themselves against the migrating desert sands. The remains are remarkably well preserved today due to the arid climate. The striking juxtaposition of the manmade and the irresistible forces of nature makes for some extremely compelling photography. Visit Kolmanskop first thing in the morning when there is the least amount of distracting footprints in the sand. Overnight winds blow and sift the sand through the buildings so you should have fresh, untrampled scenes in the morning. Obtaining a photographer’s permit can get you in early before general admission begins. Walvis Bay, a small town on Namibia’s Atlantic coast, is one of the best locations in Africa to photograph greater and lesser flamingos, often at a very close distance. The birds can be found wading the flats in the lagoon right in the center of town, or in the nearly marshes and salt flats. As many as 50,000 flamingos can be seen at any one photo shoot. Morning light is considered best, when the birds in the lagoon are getting warm, low-angled front light. The sun sets over the water, which means evening shoots are almost entirely silhouetted birds. There is a persistent marine layer of fog just offshore, which often blocks the sun as it readies to greet the horizon. But if the wind happens to be blowing in, the fog reaches the beachfront which can lead to misty and moody flamingo images, a nice change from the usual. I exclusively use Really Right Stuff tripods (TVC-24L and TQC-14), monopods (MC-34), ball heads (BH55, BH40 and BH35) and all RRS camera and lens plates. Richard Bernabe is a photographer, book author, educator, and keynote speaker from the United States. He’s traveled to more than 50 countries while photographing for leading publications and media organizations. Richard is a global influencer in the fields of photography, travel, and wildlife conservation with more than 1.3 million followers over various social media platforms. 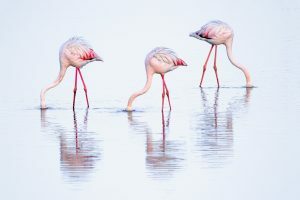 In addition to traveling across the globe on photo assignments, he leads photography classes and workshops (https://www.richardbernabe.com/workshops) for photo hobbyists and fellow travelers, sharing his passion for wild and exotic places and capturing their essence with the camera. For more information, visit www.richardbernabe.com. Amazing portfolio, it is interesting that Namibia is you favorite, it is second on my list after Amboselli as I want a photo elephants in front of Kilimanjaro first. The way Namibia has chosen to manage wildlife for the people is fascinating and seems to be a huge success for the wildlife and the tribes.